The Chūgoku region (中国地方, Chūgoku-chihō), also known as the San'in-San'yō region (山陰山陽地方, San'in san'yō-chihō), is one of Japan's traditional regions. 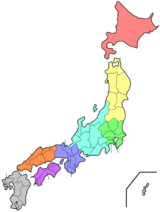 The Japanese conventions of geography and history divide the nation into eight regions, including the Chūgoku region. These have been used since 1905 as basic units for description and comparison and as cultural markers. In the late 7th century, the San'indō and San'yōdō were identified as two of the eight largest administrative areas of the Imperial system (ritsuryo seido). Gokishichidō is an ancient system of names for parts of the country, including San'indō and San'yōdō. Chūgoku covers a western part of the island of Honshū in roughly the same area as the traditional San'indō and San'yōdō. In the Meiji period, the modern regional system was made by Imperial decree. Japan was divided into regions (chihō), including the Chūgoku region. A regional council (chihō gyōsei kyōgisai) was headed by the governor of the most powerful prefecture in the regional grouping. The council also included regional chiefs of central government ministries. Over time, Chūgoku has developed its own regional dialects, customs and unique traditional culture. ↑ Nussbaum, Louis-Frédéric. (2005). "Geography" in Japan Encyclopedia, p. 242; "Chūgoku", p. 127. ↑ LOC, "Chugoku"; retrieved 2012-4-15. ↑ 9.00 9.01 9.02 9.03 9.04 9.05 9.06 9.07 9.08 9.09 9.10 9.11 9.12 9.13 Titsingh, Isaac. (1834). Annales des empereurs du japon, p. 65 n3; Nussbaum, "San'in" at p. 817.